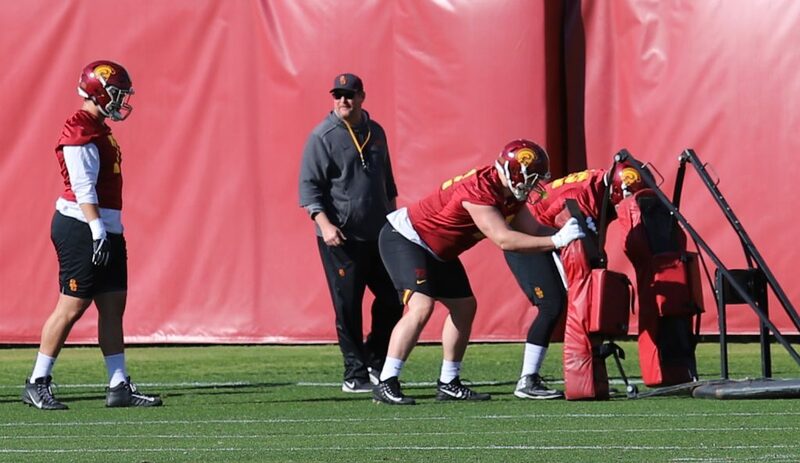 What we know and what we don’t know heading into the final week of USC Trojans spring ball. What we know: All four quarterbacks can run this system effectively. True freshman Kedon Slovis has been terrific this spring and looks every bit like a player who has the ability to stay in the quarterback competition. 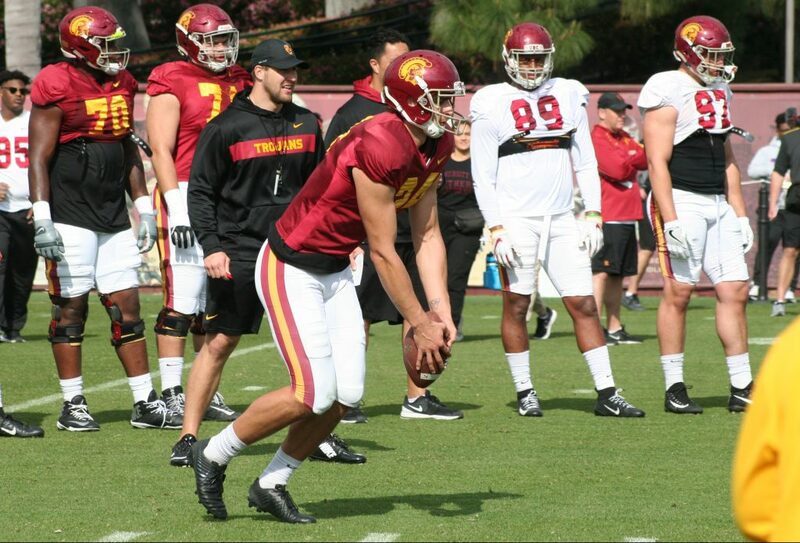 We also know that spring ball practices are not capable of simulating true game situations, and no spring ball practice in the country is going to open its quarterbacks up to full contact, so we might never get to see Jack Sears’ biggest strength in a practice setting. What we don’t know: Obviously, the quarterback depth chart. We think we know that if the season were to start tomorrow, JT Daniels would be the starter. We also don’t know when head coach Clay Helton will name a starting quarterback, and that remains a huge question. This is the third quarterback competition he’s handled and an argument could be made that he didn’t handle either of the previous two flawlessly, selecting Max Browne over Sam Darnold, then not giving Daniels enough time with the first team offense to truly establish himself last fall camp. 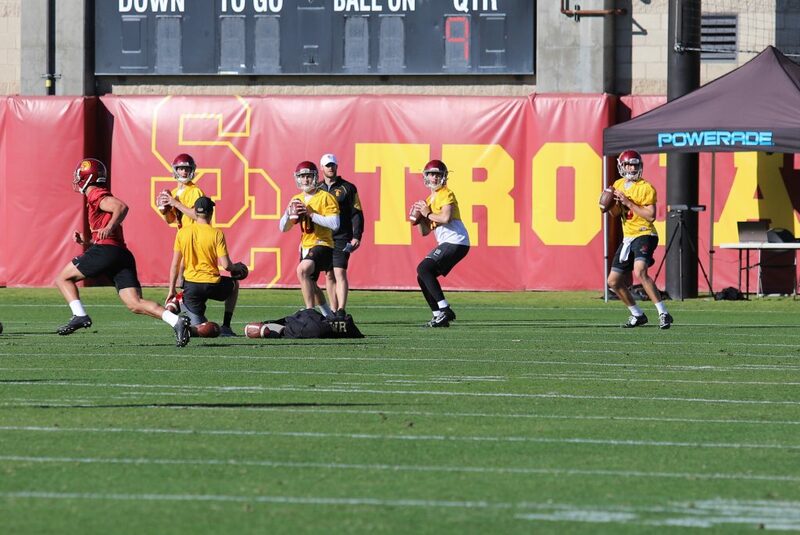 The four quarterbacks still seem to be taking an equal number of reps, and that’s not something that can happen during fall camp, when the starter needs to be getting a majority of the work. What we know: The top three backs in this group might make this the best tailback group in the conference. Markese Stepp has been terrific this spring and Stephen Carr looks at least almost all the way back from nagging injuries that significantly slowed his sophomore season. Walk-on Quincy Jountti has been a revelation this spring as well, and probably capable of playing this fall. What we don’t know: The rotation. It wouldn’t surprise me to see any of the three (Steps, Carr, or Vavae Malepeai) step on the field first this fall, and we could be seeing two at a time on occasion. But I’m curious as to how offensive coordinator Graham Harrell utilizes his backs this fall, especially because this offense wants to go fast, and rotating backs in and out during a drive will slow the offense down in a hurry. Will the backs rotate from drive to drive, or is this something where one back takes the lead and becomes the go-to for the entire season? I can’t imagine having to make that kind of decision between the three, but Harrell did rely on just one guy heavily last year at North Texas. The talent in this stable is obviously different, but the system isn’t. What we know: Throw it up. Someone’s going to come down with it. Michael Pittman, Tyler Vaughns, Amon-Ra St. Brown, and Devon Williams have been phenomenal this spring as returning players, and John Jackson III has been a strong addition from Day 1 this spring. These five are going to catch a bunch of passes this fall. What we don’t know: Who else is there? Five receivers does not a receiving corps make. We’ve seen a few walk-ons get a bunch of reps this spring, but the door is wide open for Drake London, Munir McClain, and Kyle Ford to step up this fall. No 2019 signee has been to more spring ball practices than London, while McClain has been a consistent presence as well. Will Ford be healthy enough to begin practicing when fall camp opens? If so, he has the talent to step right into the rotation. If the top four receivers can stay healthy, this unit could be dominant. What we know: Tight ends are going to see the field and the ball in this offense. We’ve seen plenty of work for Josh Falo and Erik Krommenhoek this spring, while Jude Wolfe was a big presence before a back injury sidelined him. What we don’t know: Daniel Imatorbhebhe continues to be the missing man this spring, and it’s probably safe to assume that he won’t be contributing again this fall. But injuries continue to hit this position, as Falo missed time with a shoulder injury, and Wolfe will be held out the rest of spring with his back issue. Can Krommenhoek turn into a legitimate passing threat? And can Falo and the true freshmen (Ethan Rae joins the group this fall) serve as legitimate blocking assets in the running game? What we know: It sure looks like we know the starting lineup, as (when they’ve been at practice) Austin Jackson, Alijah Vera-Tucker, Brett Neilon, Andrew Vorhees, and Jalen McKenzie have routinely formed the first-unit offensive line. And we sure think we know that the snapping issues will be fixed. Spring ball practices are obviously different than a game in South Bend, but errant snaps have not been a massive issue through 12 practices. What we don’t know: We don’t know yet if the offensive line will be an improvement from last year. And that answer probably won’t come until the Stanford game. We’ve seen the line go hot and cold this spring, but that shouldn’t cause much panic as the group breaks in three new starters and a completely new offensive system. 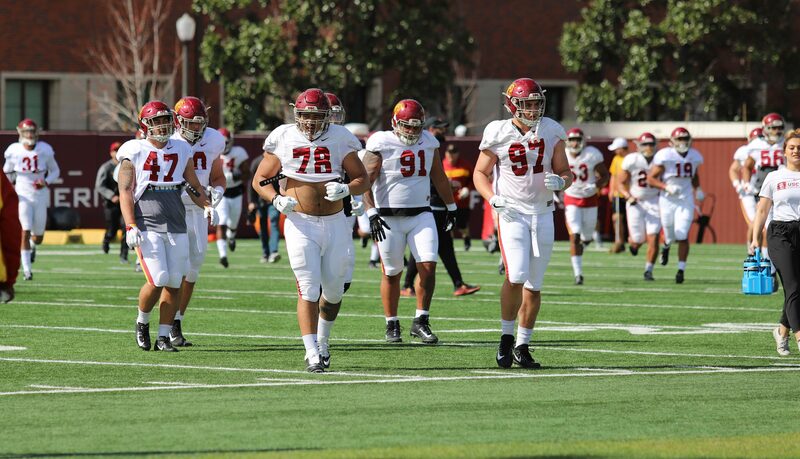 At this point, it’s easier to say that we just don’t know anything about the offensive line, because there probably isn’t a group that Trojan fans are taking a “wait and see” approach to more than the offensive line. What we know: The defensive line should be better than last year. The veterans in Christian Rector, Jay Tufele, Marlon Tuipulotu, and Brandon Pili are playing at a high level this spring and have been dominant at times. Defensive line coach Chad Kauha’aha’a has them playing across the line of scrimmage and getting into the backfield. We also know that true freshmen Drake Jackson is going to play, and play well, this fall. What we don’t know: We don’t know yet if this will be a truly dominant line. We know it can be, but there needs to be a big uptick in production from last fall. Where do the sacks come from? Can Rector get back to taking down quarterbacks, and does Tufele become the interior monster that terrorizes opposing centers and guards? We also don’t know whether that starting group can get some help from its backups. We’ve seen signs of life from Connor Murphy and Jacob Lichtenstein, but getting real and consistent production from them this fall could keep pressure on offensive lines when the starters need a rest. What we know: There is probably more depth here than any position on the roster. Palaie Gaoteote is ready to become a star in this conference. Jordan Iosefa and Kana’i Mauga have been really good in their transition to the middle from the outside, and it wouldn’t be surprising to see John Houston elected as a team captain from the defensive side. We also know that Ralen Goforth is going to be the last guy to leave the field after every practice and is another potential future captain for the Trojans. What we don’t know: Can the SAM ‘backers get to the quarterback? There is a ton of young talent in Hunter Echols, Eli’jah Winston, and Abdul-Malik McClain that will be unleashed as pass rushers (and occasionally asked to drop into coverage). 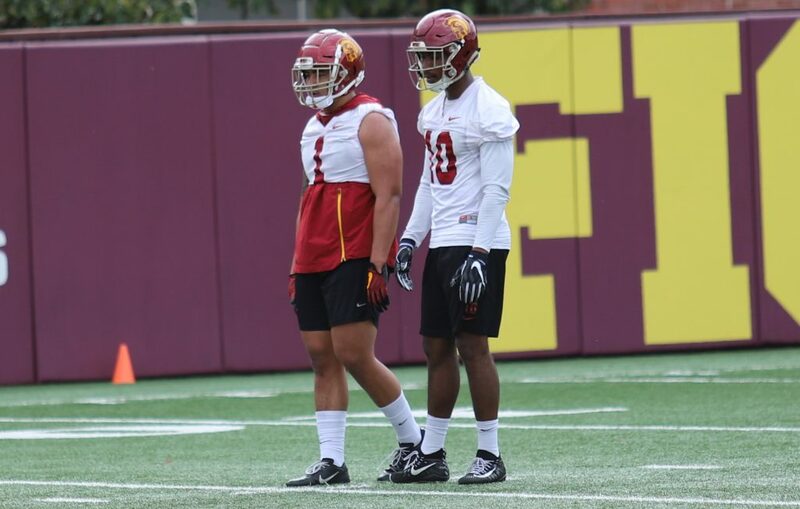 And if that trio is asked to serve as de-facto defensive ends, the position needs to go back to the production of Uchenna Nwosu of two years ago, rather than what USC got from it last year. We also don’t know how flipping the two inside linebackers will go, as Houston/Iosefa are in the middle, with Gaoteote at WILL. Can Houston hold up against the run in the middle? Will this allow Gaoteote the freedom to make plays all over the field? What we know: There is very little depth anywhere and incoming freshmen are going to get a ton of reps this fall. We also know that Talanoa Hufanga is ready to make the leap to conference, and perhaps national, star. And Isaac Taylor-Stuart is ready to make the leap to reliable starter. What we don’t know: Can this group stay healthy? Five potential starters have missed all or parts of spring ball due to injury. Can they make it through a full fall slate? And are interceptions on the menu for this group? It seemed almost difficult to deflect as many passes with as few interceptions to show for it as the USC defense had last year. And how many diamonds did this coaching staff dig up in this recruiting class? Cornerback Max Williams is the only non-three star addition of the eight defensive backs signed in the 2019 class. We’ve already seen that safety Briton Allen is a future (or maybe current) contributor. Can juco transfer Jaylen Watson jump in right away this fall, or can any of the late additions (Adonis Otey, Jayden Williams, Kaulana Makaula) find a spot on the two-deep? What we know: Punter Ben Griffiths is for real and the defense should get a real boost from his ability to pin opponents deep. 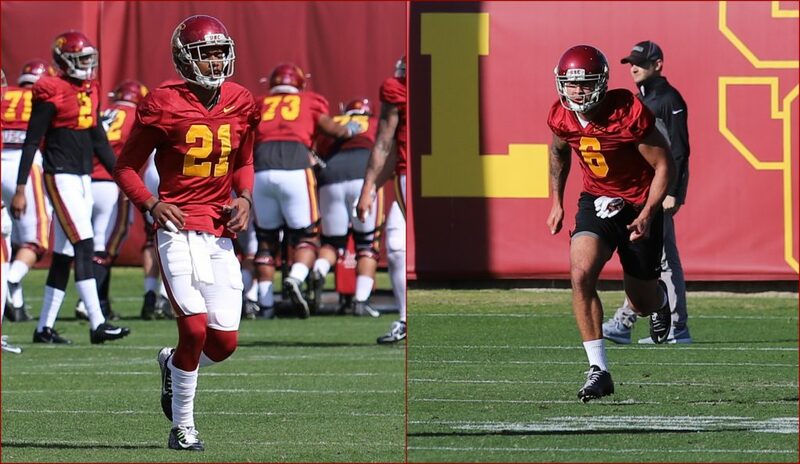 And we think we know that the Trojans could go with established offensive stars as returners, as we’ve seen Michael Pittman, Tyler Vaughns, Stephen Carr, and Amon-Ra St. Brown (among younger players and non-starters) handling return duties. What we don’t know: Will kicker Chase McGrath slide back in as the starting placekicker when he returns from injury? And will all this extra special teams work pay off in terms of producing coverage and return units that truly tilt the field toward the Trojans?